We return today to Jesus' powerful words: Follow Me. This commandment is the basis for the entire Christian life, and as we discussed yesterday, it is an urgent matter. Today, we will examine its profound difficulty and God's answer. When Jesus compared following Him to carrying a cross, He knew the death He would die. He does not have a silver necklace in mind, but a massive beam of splintering wood, used for torture and execution. When Jesus called it dying to yourself, He knew more about death than anyone else who has ever been. When Jesus told the wealthy man to give up all He had - remember it was the one who left the glories of heaven who spoke! 2 Corinthians 8:9 is a powerful injunction. To follow Jesus is to walk the path He walked. 'What would Jesus do?' is much more extensive than we often make it. He would give up all glory to serve the lowest of the low. He would reach out to the outcasts, the harlots and anyone who would have Him. In a country such as ours, Jesus still commands us to be Downwardly Mobile. Couched in our materialism, it is hard to think of a more difficult command than that. But Jesus asks more. If we are to follow Him, we cannot just have servant actions, but a servant heart! It is not enough to God to appear good and to bring our external actions into line with His will. We must bring our very identities into conformity! Philippians 2:5-8 tells us that we must have the same servant's mindset that took Jesus to the cross. It is no easy task to become a totally new person. Now we see why Nicodemus struggled when Jesus told him that he must be born again (John 3). A yoke has two notches. The reason Jesus' yoke is easy is because he became a servant. Because he bends down low and carries our burden with us, the weight is off our shoulders. It is not my responsibility to be good enough - but God's promise to make me so. With men, these things are impossible! With God, all things are possible (Matthew 19:25-26). The same God who calls us to follow, empowers us to follow. Cheer up, weary one. 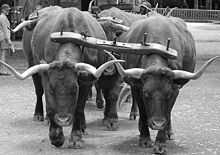 It is hard for the ox to pull the cart with his neck twisted around, staring at his burden. Take your eyes off your troubles and put them on your Jesus! Let the dead bury their own dead, let the riches of the world rot alone, but follow the Lord. He will not lead you astray. May we realize that the call to follow is a hard one, but choose to accept it anyway. May we see that God empowers us to carry out these duties and that we need not do it alone. I pray that we submit happily to what God has given us and to follow even to the death. In closing, let me share another hymn, about which the author wrote: "Long­ing to give up all for Christ who had giv­en his life for me, I want­ed to be will­ing to lay ev­er­ything at his feet, with no wish but to do his will, to live hence­forth on­ly for his glo­ry. Out of this feel­ing came the hymn, ‘Fol­low On.’ It was writ­ten with the pray­er and the hope that some heart might by it be led to give up all for Christ."